Double parking has become such a common issue in Malaysia no one really complains about it anymore—we just heave a sigh of resignation and surrender ourselves to the unfortunate fate that has befallen our car, after blasting our horns or spamming phone calls. But these 3 decided to fight against it and made an app that will hopefully combat, if not solve, all of our parking woes related to this issue. 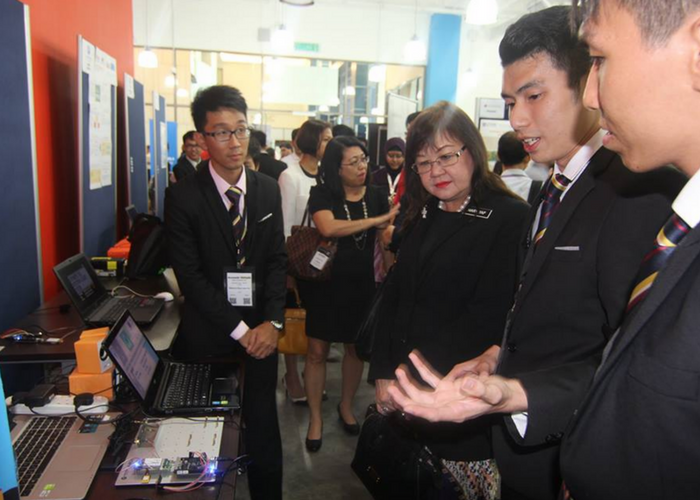 UTM graduates Edward Chan, Gan Yi Reng, and Leow Tan Chun Kit took part in Innovate Malaysia Design Competition last year, where they worked together to create an app that would tackle double-parking in congested cities. Naming their app ParkKing, they managed to win first prize in two categories of the competition: the Cyberview Design Challenge and Motorola Solutions category. The project does not involve just the mobile app alone, but the whole system which includes the sensor nodes as well. First major component of the app: Discouraging double parkers. Sensor nodes need to be placed on the ground alongside the parking spots. The sensors are able to detect if there is a car parked in the spot or if there are any other cars double-parked that are blocking the spot. Once a car double parks next to the spot, the sensor will automatically detect it and send the information to the app and system controller, which will either be the management of the building or the local city council. The system controller receives a notification about the double-parker, and they can then decide on the appropriate action, be it to send a parking attendant to issue a summon or see if the car needs to be towed. The app also helps users locate available parking spots nearby so that they do not have to double-park or circle aimlessly around. 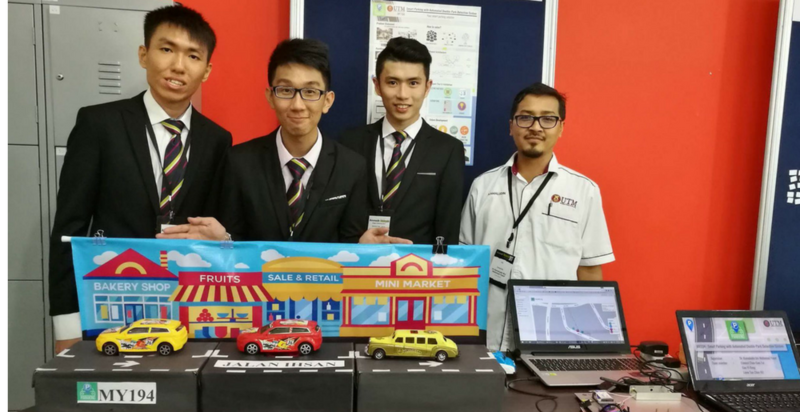 With that vision in mind, they hope to beta-test their app on the streets of Cyberjaya or any cities that have the potential to become a smart city in Malaysia to showcase its potential to prospective users. They also intend to cooperate with Cyberview whose key goal is to transform Cyberjaya into a smart city concept to improve urban living. ParkKing also aligns with their goal to provide drivers with the best user-experience through their system in improving the efficiency of their daily parking and driving activities. Making the app didn’t prove easy for the trio as they had to learn how to code from scratch, from YouTube tutorials alone. Gan Yi Reng explaining how the app works. Even after graduating, they still work on the app as a side project, because they believe that it is something that will be essential in the future. The main obstacle they are facing now is bringing the app to the public, as they need to have the sensors installed at parking lots and allow the public to have access to it. They plan to do a presentation to a local council to get the app approved for city implementation and are also looking for investors to fund their project. Each sensor is estimated to cost RM200 including installation, which is why they are keeping an eye out for business partnerships. Apart from its main function, ParkKing will also introduce Park Rewards, as one of the features for the public to report any illegal parking activity in the city. Encouraging citizen vigilance, all the user has to do is click on the ‘Report Illegal Parking’ button in the parking icon. He or she then has to snap a picture of the double-parked car and send it out through the app. For each verified report, the user will be rewarded with Park Rewards, which the user can use to redeem for vouchers or free gifts. This platform indirectly facilitates a two-way communication between the city council and public users in deterring illegal parking activities across the city. The three of them believe that smart technology is the future of Malaysia, with parking as the first step of action. Currently, the ParkKing team are still working on improving the hardware and features of the app. You can follow their journey to perfect their project here.